I met Shan on a nice Hong Kong Sunday afternoon and we headed to the Sham Sui Po market for a little shooting. We also had some great discussion about the movie industry, since Shan is a producer in his daily life. The day ended by a visit to a used camera shopping center where we saw endless quantities of wonderful gear. So here is an interview of Shan to discover a bit more about his photography. Shan with his Leica M9 and 28mm Elmarit. – You work as a movie producer in your every day life. How does it influence the composition and mood of your street photographs ? In movies we always look for a good story and emotional contact. This has influenced my photography. I don’t want to just “point out” a place or a person, but convey an emotion through the image. Ideally I hope my pictures can resemble movie stills. Visually I like to shoot at night, or places with mixed/contrast lighting. It gives the picture a richer texture. This is not hard to do in HK because the city has a very rich nightlife. 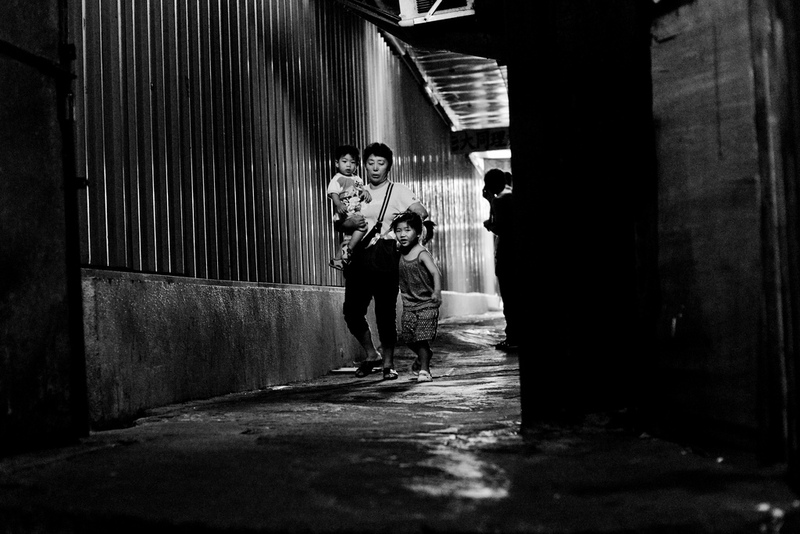 Mother and her two children walking through the shadowy hallway (M9 + VC 50mm Nokton). – People in the streets seem completely absorbed in their own world. 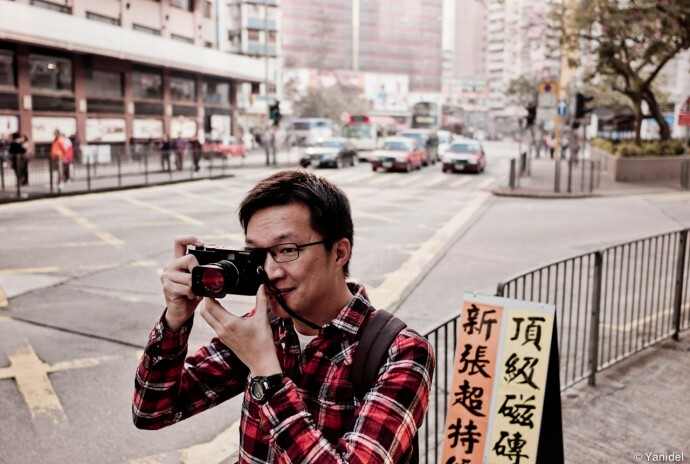 Can you explain us a bit the Hong Kong culture and how it impacts street photography ? In HK when people see a camera pointed at them, they would quickly turn away or give you an upset look. I don’t like this relationship between my camera and my subjects. My solution is to shoot from the hip – I would zone focus my lens and snap from waist level. People’s faces become more natural when they’re not self-conscious. 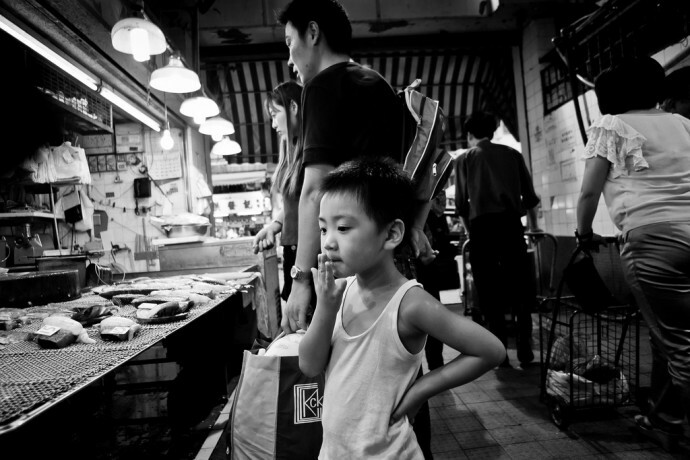 Boy chewing a toothpick in street market shot from waist level (M9 + VC 21mm Color Skopar). – You had a 28mm lens mounted on your Leica M today ? 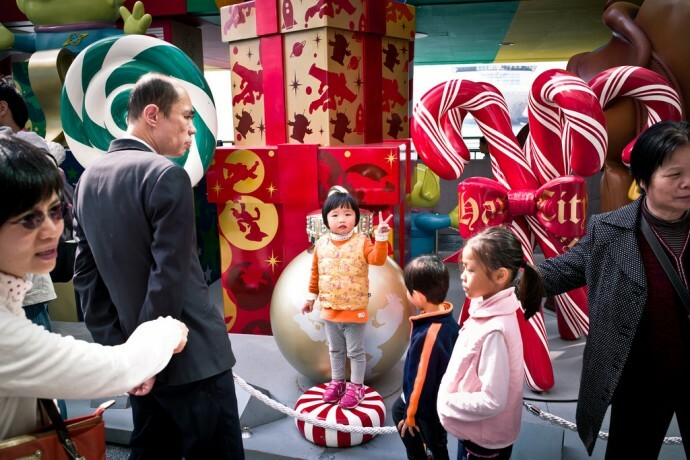 The best focal for Hong Kong ? I find anything wider than 35mm a good focal length. The crammed environment of HK forces you to go wide in order to keep a good distance between your camera and the subject. Also, due to the quick pace of HK streets, wide angle lens gives you more room with zone focus, making shooting fleeting moments easier. And lastly, I think street photography is a combination of people and their environment so wide angle is definitely a way to go. I used to shoot with 21mm and 35mm. I just got the 28mm so I’m still earning to use it. Thank you Shan and good luck for your next movie ! Une belle rencontre. Et un travail remarquable. J'aime qu'une image raconte une histoire. C'est, à mon sens, le meilleur véhicule de l'émotion.